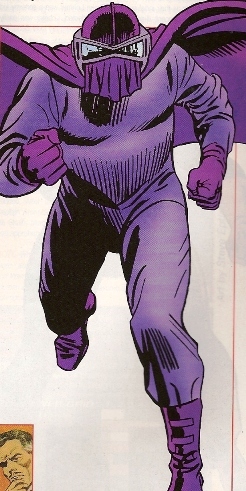 Powers/Abilities: The Masked Marauder is a talented inventor who has designed several weapons, including his goggles, which are enhanced with infrared sight and can fire his opti-blast, which is capable of blinding an opponent temporarily or permanently, stunning others, or causing physical pain. In addition, he has designed a special laser, an ionic reinforcer, an ionic dissembler, a suit of armor that would rival Iron Man, including offensive weaponry such as tear gas, enhanced strength, and an energy drainer (with the help of his aid Steele), a teleportation device, shock shatter rays, a force field with a disintegration layer, and tear gas spraying cameras. Most prominently, the Masked Marauder has designed three versions of the Tri-Man, capable of absorbing the abilities of humans or animals and channeling them into itself, enhancing his own abilities; one version of the Tri-Man could change its form and possessed deadly explosives. Masked Marauder wears armor designed to absorb kinetic energy and rechannel it, and has enhanced strength, a capto-lock, and a steel-plated top. Masked Marauder has had access to vast amounts of technology, including flying zeppelins and helicopters. He briefly had the vast resources of the Maggia at his command. (All-New Official Handbook of the Marvel Universe Update I#3) - Frank Farnum, the manager of the building containing the law offices of Matt Murdock and Franklin "Foggy" Nelson, was a mechanical genius who financed (presumably) his own inventions, which he used to bolster his own criminal plans. Under the guise of the Masked Marauder, Farnum developed a gang following. (Daredevil I#16 (fb) - BTS) - Criminal mastermind, the Masked Marauder, led his gang in a raid of the World Motors building in an attempt to steal the blueprints of a new experimental motor, but the heist was foiled by Spider-Man. Pictures of this battle appeared in the newspaper. (Daredevil I#16) - The Marauder dressed many of his gang like the hero Daredevil and sent them out to scour the city, telling them to provoke Spider-Man into thinking the real Daredevil was after them. One of his men questioned him, so the Marauder hit the man with a blinding opti-blast as an example to the others, then he sent his men on their mission. The Marauder soon received word that two of his men had successfully fought Spider-Man and rushed off, and he knew that Spider-Man would be on the lookout for the real Daredevil now. After he received word that the two heroes were battling, the Marauder loaded his men into a truck and returned to the World Motors building to execute Plan W, stealing the motor. The building was deserted, so they lifted their hydraulic hoist and the Marauder sent his men up onto the floor with the motor. A couple of guards, early in their rounds, approached the Marauder, so he blinded them with a powerful visi-blast. His men soon returned with the blueprints and the Marauder rushed away in a second car, which had been stored in the back of the truck. The Marauder then revealed his plans to the men on how he would sell the blueprints to underworld organizations. (Daredevil I#17) - The Marauder learned from J. Jonah Jameson, in a television ad, that he had failed to retrieve the formula needed to activate the engine. He assembled his men again and planned to return to the building, putting together a new assault plan. Meanwhile, J.W. and the other employees of World Motors contacted the National Guard for protection. The Marauder loaded his men into a World Motors blimp, allaying the concerns of assembled police, including Dave. The Marauder and his men climbed down on to the roof, and the Marauder hit the guards there with an opti-blast. Spider-Man attacked, defeating most of the Marauder's guards while the Marauder watched, furious. He hit Spider-Man with an opti-blast then prepared to kill the hero, but Daredevil attacked. He hit Daredevil with a blast as well, but the hero was unaffected. The Marauder shook off one blow then attacked Daredevil with his fists while the Marauder's men tried escaping on the blimp. Daredevil hit the blimp with a blast gun, causing it to crash. In all the chaos, the Marauder donned the uniform of a guard he'd knocked out and escaped. He soon heard a pedestrian Foggy Nelson confessing to Karen Page that he was Daredevil. (Daredevil I#18) - Identifying himself as Mr. Dunn, Farnum stopped by the offices of Nelson and Murdock and introduced himself to Karen Page, wanting to discuss their rent situation and the fact that they had paid late several times. Karen was feeling faint, however, so Dunn called a doctor for her. Matt Murdock returned to take care of Karen and Dunn asked after Nelson, promising to return the next day. (Daredevil I#19) - The Masked Marauder sent his men to free the recently captured Gladiator in order to propose an alliance. Gladiator was furious, claiming he didn't need the Marauder, but the other villain proved his power by blinding Gladiator with an opti-blast. As Gladiator was still recovering, the Marauder spoke to several hired criminals, including Big Joe, that he was sending after Nelson. The Marauder threatened them if they failed in their mission, and ensured that he could be the one to knock Daredevil off. Gladiator listened as the Marauder shared his plans to put Gladiator in charge of his armies, but he shocked the Marauder by leaping forward and striking him repeatedly. Though his wrist units were damaged, Gladiator still declared that he would command the Marauder's actions and successfully shut off the Marauder's opti-blast component. The Marauder tried fighting back by ramming Gladiator with his steel-plated helmet, but Gladiator merely shrugged off the punch. The fight was interrupted by one of the Marauder's men announcing that Nelson wasn't really Daredevil, and that the true Daredevil had defeated the others. Gladiator and the Marauder agreed to partner up until Daredevil was defeated. (Daredevil I#22 (fb) - BTS) - The Marauder developed a powerful levitator ray that would allow him to bring selected subjects from one part of the world to another, preprogrammed into the ray. He also developed a Tri-Man android that would allow the skills of three humans to be downloaded into its large robot body. He and Gladiator learned that the Maggia, a European crime cartel, had been left leaderless. Farnum also set up an account with Nelson and Murdock. (Daredevil I#22) - Farnum visited Nelson and Karen Page at the law office, asking if they'd drawn up any new leases for the conversion of the building from leases to a cooperative plan. Nelson assured him that they needed a few more days to put them together. The Marauder and Gladiator put together their plans to take over the Maggia, figuring they could activate the Tri-Man to defeat Daredevil publicly. Gladiator was frustrated in relying on technology rather than his own skill, but he agreed to go along with the plan. They used the Levitation Ray to retrieve the Mangler (a talented wrestler), the Dancer (an agile safe-cracker), and the Brain (a criminal mastermind), who all willingly agreed to download their skills into the Tri-Man. The Tri-Man was activated and the Maggia agreed that if Daredevil was defeated, the Marauder and Gladiator would be considered for leadership. The Tri-Man invaded a public boxing match and announced that he would harm the bystanders unless Daredevil fought him. Daredevil arrived and managed to defeat the robot, so the Marauder, over the loudspeaker, threatened to harm Nelson and Page if Daredevil didn't surrender. (Daredevil I#23) - Though Gladiator was skeptical, he planned to bring Daredevil to their headquarters and add the hero's powers to the robot. He activated his levitation ray and brought Daredevil and the Tri-Man back. Daredevil defeated the freed Dancer, Mangler, and Brain, and fought off the Gladiator. Daredevil and Gladiator savagely fought, Gladiator protected from injury due to his armor, until Marauder sent them both to Europe with the levitation ray at the Maggia's instruction. Gladiator was furious that the Marauder had betrayed him so easily. The fight, however, ended without Daredevil's defeat, so the Maggia cut off communications with the Marauder. (Daredevil I#26 (fb) - BTS) - The Marauder determined that Nelson and Murdock must have knowledge of Daredevil's true identity. (Daredevil I#29 (fb) - BTS) - He put a note in a special safe with this knowledge, instructing his men to open it if he disappeared. (Daredevil I#27 (fb) - BTS) - The Marauder also designed a helicopter with an expanding force field that destroyed anything that touched it. (Daredevil I#26) - Having heard that Nelson and Murdock were providing the defense for the super-criminal Leap-Frog, Farnum paid a visit to Nelson and Page and expressed his disapproval. Nelson defended their right to provide defense for criminals, then left with Murdock's proclaimed twin brother, Mike. Later, dressed as the Marauder, he snuck into the law offices, using his van and hydraulic lift to get in, and searched the premises for over an hour on Daredevil's true identity. Later still, he drug Stilt-Man's unconscious form away from a fight with Daredevil, where the villain had been defeated. He drove safely away without Daredevil expecting anything, but when Daredevil used Farnum's name, Farnum realized more than ever that Daredevil was someone he knew. (Daredevil I#27) - The Marauder showed Stilt-Man the specially-prepared helicopter and demonstrated the force field, convincing the reluctant Stilt-Man in the partnership. After the Stilt-Man demonstrated his powers as well, the Marauder proposed they capture Nelson, Murdock, and Page. Stilt-Man apprehended the trio, using sleeping gas to ensure the capture, and bound them all aboard the Marauder's helicopter. They left a note behind for Daredevil, but Matt Murdock willingly revealed that his twin brother Mike was Daredevil. The force field lowered, Stilt-Man went down to find Mike. The Marauder now vowed to kill the captured trio by forcing them out of the helicopter. He started with Murdock, as he'd been the one to betray Daredevil. Murdock managed to charge the Marauder, who fired a shot, severing Murdock's bonds. The Marauder then fell against a button, deactivating the force field again. Murdock fell from the copter and Daredevil soon swung back in, claiming to have been hanging on the copter the entire time. Daredevil kicked the Marauder, who fired off a shot before falling against a control switch the sent the helicopter spinning. Daredevil revealed he knew that the Marauder was Farnum, who, with his gun drawn, pulled off his hood and reactivated the force field. When the copter pitched, the Marauder fell out and was apparently killed against the force field. (Daredevil I#29 - BTS) - The Marauder's gang found his note, were taken over by the Boss, and were defeated by Daredevil. (Iron Man I#60 (fb) - BTS) - The Marauder survived by teleporting away, but he remained in hiding for several months, planning his next heist. Planning on stealing a valuable experimental space shuttle from Stark Industries, Marauder recruited Hacker and Steele to join him and designed a special laser and an ionic reinforcer for the job. Marauder and electronics expert Steele designed a suit of armor that would rival Iron Man, including offensive weaponry such as tear gas, enhanced strength, and an energy drainer. (Iron Man I#60) - Marauder led his men to the attack, cruelly blinding a guard as they rushed into Stark's facility. As they stole the shuttle, he bragged that Iron Man would be no match for them. That night, Iron Man tracked them down and defeated Marauder's men, then an armored Steele attacked Iron Man, seemingly defeating him. Iron Man shockingly revived and defeated Steele, so Marauder fired multiple blasts at the hero, who narrowly evaded the destructive energy as it demolished buildings and countryside. Iron Man hit Marauder from behind, but Marauder's armor absorbed the shock of the blows, then he blinded the hero with an opti-blast before knocking him out with another shot. He triumphantly picked up Iron Man and took him captive. (Iron Man I#61) - Keeping Iron Man captive within a Capto-Lock, Marauder switched his plans to demand a billion in ransom from the USA. If he wasn't paid, he vowed to equip the shuttle as a bomb and destroy the city of Detroit. As Steele looked over Iron Man's armor, the hero managed to escape and defeat Steele, but Marauder buried him under heavy machinery and defeated him again. Marauder called Stark Industries to deliver his ransom demand through secretary Pepper Potts. Iron Man then freed himself and attacked again, hitting Marauder and getting blinded by a steady dose of opti-blasts. Quickly overcoming the blasts this time, Iron Man buried Marauder in the crashed machinery, but Marauder's armor absorbed the energy and directed it through an ionic dissembler to kill the hero, but Iron Man used his uni-beam to knock Marauder out. (Werewolf by Night I#42) - Marauder led his thugs, including Creach, Strenk, and Pardee, in robbing the National Bank. As they used a torch to break inside, heroes Werewolf and Iron Man attacked, but Marauder was pleased when they started battling each other, and led his men in to finish the robbery. As they departed the bank and the helicopter descended to pick he and his men up, he took time to blind both heroes, then hit them with a power blast before departing. On the copter, Strenk complained that they didn't ensure the heroes were dead, then Marauder shared his plans to build a new Tri-Man, deadlier then before. He captured a gorilla, a cheetah, and an alligator from the zoo. Returning to their abandoned warehouse headquarters, Marauder and his men began downloading the animals' skills into the Tri-Animan just as Iron Man and Werewolf attacked again. The powerful Tri-Animan then attacked the heroes. (Werewolf by Night I#43) - As the android fought the heroes, Marauder began planning his revenge on the Maggia in Europe as well, then turned the android up to full power, causing the animals to escape and the computers to overload. Marauder rushed for his helicopter, planning on using its back-up computer to get the android back under his control, while the animals attacked his men. Marauder followed the creature across town and slowly began increasing his electronic control over the creature, guiding him against the heroes, who soon defeated it and knocked the copter into the water. Marauder was soon arrested. (Daredevil I#192 (fb) - BTS) - The Marauder left behind valuable properties to his brother, Barry Farnum. (Spectacular Spider-Man II#23 (fb) - BTS) - The Big M's crime cartel influenced criminal activity worldwide, involving such agents as the Kingpin, Silvermane, Hammerhead, and AIM. (Spectacular Spider-Man II#22 - BTS) - When the Big M received word that Moon Knight and Spider-Man were interfering with Maggia operations, he sent Cyclone to take them down. (Spectacular Spider-Man II#23) - After subduing the heroes, Cyclone killed the informant for breaking protocol and calling Big M. Cyclone later chaired a meeting with various criminals at Grant's Tomb for Big M, though it was soon attacked by the two heroes. Big M peeked in to see the fight and departed, leaving his allies to be captured. (Spectacular Spider-Man II#24 - BTS) - Maggia men stole nuclear materials for Big M.
(Spectacular Spider-Man II#25) - When the deadly Carrion approached Big M and his men with a request to handle Spider-Man, Big M considered him too dangerous and refused. Trying to prove his power, Carrion murdered Big M's men, but Big M refused to reconsider and tried jettisoning Carrion away, though Carrion simply teleported free. Utilizing his newly developed Birdroid, Big M accompanied his men, who complained about following a machine, on a bank heist. When Spider-Man attacked, Big M held back, wanting to know how Spider-Man had learned where to attack him before. The Birdroid exploded into the vault, then transformed into an android to raid the bank. While Spider-Man was distracted, Big M revealed his identity to be the Masked Marauder and blinded the hero. (Spectacular Spider-Man II#26) - Marauder sent the Tri-Man against the blinded hero, who recoiled from repeated punches. The Maggia men told Marauder of the cops approaching and they quickly raided the vault and fled in a helicopter. (Spectacular Spider-Man II#27 (fb) - BTS) - Having the nuclear and financial resources he needed, Marauder was prepared to go forward with his plans. (Spectacular Spider-Man II#27) - Marauder equipped the Tri-Man with a deadly bomb and planned to blackmail the city. He told the mayor of his new Bombdroid just as Daredevil and Spider-Man attacked, easily pushing past Marauder's men. Marauder sent his robot to deliver its payload. (Spectacular Spider-Man II#28) - While Spider-Man struggled to stop the bomb and Daredevil battled the Maggia men, Marauder demanded that the mayor turn the city over to the Maggia. Daredevil plunged the building in darkness and defeated the men, but Marauder, using his infrared mask, hit the hero with an opti-blast. 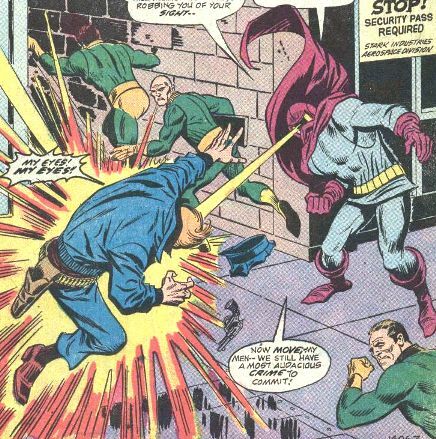 Daredevil punched Marauder repeatedly, knocking off his mask, while Spider-Man managed to destroy the bomb, shocking Farnum when he tried to activate it. Daredevil then knocked Marauder out with a single punch. (Punisher War Journal II#4) - Masked Marauder attended the wake of the Stilt-Man (Wilbur Day) at a local Bar With No Name. He saw several criminals there, including Armadillo, who he greeted with a hug, and a Doombot. Several criminals flirted with Day's widow, Princess Python, and all got very drunk as they recounted the old days; Marauder remembered his team-up with Stilt-Man against Daredevil and Spider-Man. In time, a brief brawl broke out, but Spider-Man arrived and broke it up. After he left peacefully, Marauder tried inspiring the others to be evil with him, but they all fell over due to poisoned liquor. Just before he collapsed, Marauder realized the bartender was the Punisher. Then the bar exploded. Comments: Created by Stan Lee, John Romita, and Frank Giacoia. A pin-up of the Masked Marauder showed up at the back of Daredevil Special#1. Masked Marauder received an entry in All-New OHOTMU Update I#3. Marauders of Earth-523004 @ What If...Magneto and Professor X Had Formed the X-Men Together? (Daredevil I#17) - Chairman of the board of directors for the World Motors company, J.W. was shocked when the plans for a powerful experimental motor were stolen by the Masked Marauder. 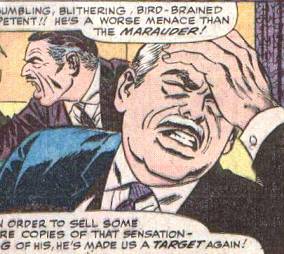 He and the others were pleased to know that the villain hadn't stolen the formula needed to make the engine work, but J. Jonah Jameson revealed this in a television ad. J.W., furious, ordered that the National Guard be summoned to protect them. 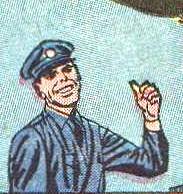 (Daredevil I#17) - A policeman guarding the World Motors building, Dave nearly called the police about a suspicious blimp until he realized it was a World Motors blimp. (Daredevil I#192 (fb) – BTS) – After his brother died, Mr. Farnum inherited his properties and agreed to try and sell them. (Daredevil I#192) – Ben and Doris Urich looked at one of the homes and fell in love with the place but couldn't meet the asking price, so Farnum agreed to investigate some creative financing with the bank. The next morning, Barry Farnum called to report the bank had approved the sale.